The key points that need to be highlighted in your resume for Bioinformatics Engineering are the skills you possess and the experience you have - internships, workshops, etc. Your fresher resume should also highlight your educational background and talk about the projects that you had undertaken in college. Your fresher resume should convey what you want from a job and how you expect your career graph to move. If new and challenging job profile is what you seek (a highly appreciated quality in Bioinformatics Engineering), then talk about that. To make it big in the field of Bioinformatics, you also need to not just have a solid background in Biology but understand the involvement of technology and have a firm grip on it. So, your fresher resume for Bioinformatics Engineering should also focus on your educational background and the additional certificates you possess. Of course, while you can put all the information in a linear fashion and call it your final resume, if and when the competition is high, such a job resume won’t really cut it. 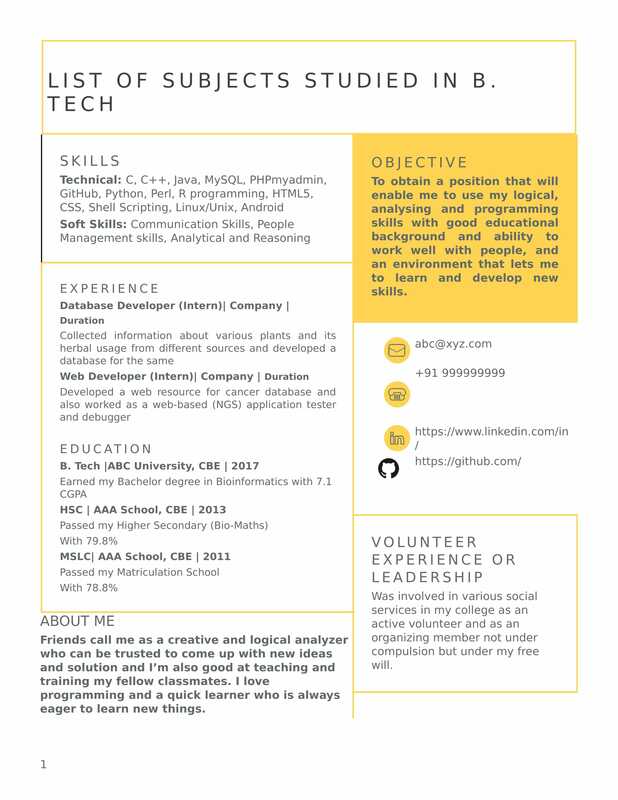 Apart from being grammatically sound, your fresher resume should also boast of a great resume template; such that it would help you stand out amongst your competitions. And, the perfect mix of everything you want and should have in a fresher resume can be met by the smart applications of the Resume Buddy.